I vividly remember bringing my first baby home from the hospital. That first evening, my husband and I sat in our screen porch just staring at him. I had the odd feeling that I was merely the babysitter and the real parents would soon return. No one is truly prepared for parenthood. The days of sleeping through the night, let alone sleeping in, are over. Sometimes, a baby cries so long and hard, the parent wants to cry, too. To be sure, the parent is not the babysitter who tolerates the trying moments for the sake of monetary reward, only to wave goodbye at the end of the evening. Of course, sleep deprivation and colic can seem like the ultimate test until a baby becomes a toddler. That’s when one distracted minute can lead to a completely unraveled roll of toilet paper or, worse yet, finger paint all over the basement walls and carpet. I speak from experience. No doubt, the early years of parenting require much stamina and patience. Yet those years are so full of joy, too. I remember the sage advice from friends with grown children. Cherish these moments. They’ll be in school, driving, off to college–grown up–sooner than you think. Indeed, somewhere between crafting a town out of refrigerator boxes and leaving home for sleep away camp, my firstborn got pretty big. This week, he turns 16. The boy who drove his Matchbox cars nonstop will soon be driving the real thing. People warned me this would happen! Those early days of diapers, constant questions, and too many stomach viruses sometimes seemed long, but the years sure have gone by quickly. Happy birthday, John! The following recipe is one we dreamed up for his summer birthday party a few years ago. Since then, this festive cake has been popular at all sorts of celebrations, both for the fun factor and make-ahead convenience. In order to create a tasty cookie that didn’t turn rock hard when frozen, I started with the classic Tollhouse cookie recipe, reducing the flour and adjusting the baking temperature. In the process, I discovered the modified recipe tasted great as basic bar cookies or a “pizza”. In the notes section, I offer the additional ways we’ve discovered to prepare and enjoy this dessert. If you have a springform pan or other 10-inch round pan, it will be helpful when filling the cookie with ice cream. If not, it can certainly be done without. This recipe can be prepared in steps and stored in your freezer until needed. Below, I provide details on different cooking options and tips that make the assembly simple. Get ready to see eyes pop and smiles stretch from ear to ear! In a large bowl or stand mixer, beat the butter, granulated sugar, brown sugar, and vanilla until light and fluffy. Add the eggs, one at a time, beating well after each addition. In a medium bowl, mix together the flour, salt, and baking soda. Half at a time, add the dry ingredients to the wet ingredients and beat until incorporated. Stir in the chocolate chips. In order to have the correct thickness for the chipwich cookies, remove 1¼ cups (10 ounces) of the dough to a separate bowl and set aside. Evenly spread the remaining batter into the prepared pans. The batter will just cover the pans completely but will not appear very thick; it will rise while baking. Bake for approximately 15 minutes or until just cooked through in the center and lightly golden on top. Cool the cookies for 15 minutes in the pan, and then carefully remove to a cooling rack. If proceeding with the chipwich, wrap and store in the refrigerator until ready to assemble. Chipwich assembly: Soften the ice cream, taking care that it does not get too soupy. Spread the ice cream evenly over the bottom side of one cookie. Top with the second cookie, pressing down lightly. Wrap and freeze until ready to use. Helpful assembly tip: If you have a 10-inch spring-form or similar size pan, line it with foil and place the first cookie, top down, in the pan and continue as instructed. 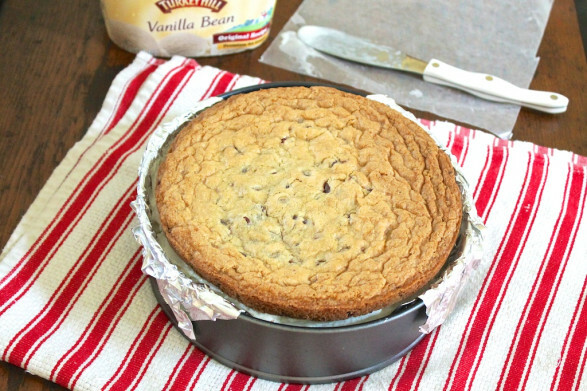 The pan provides a boundary, allowing you to fill the cookie with ice cream with little mess. The dessert can also be stored in the pan and easily removed at serving time. 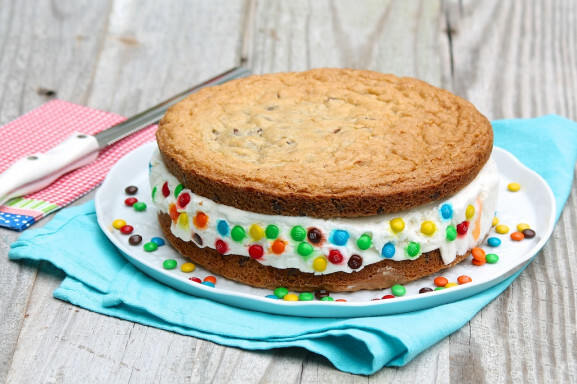 If you wish to cover the edges with sprinkles, mini M&Ms, nuts, etc., remove the finished chipwich cake from the freezer and allow the ice cream to soften slightly. Then roll the edges in the desired topping. Return to freezer until ready to eat. Before serving, let sit for 5-10 minutes at room temperature for easier cutting. ENJOY! I bake the removed dough in a 6-inch pie plate for 15 minutes at 350 degrees F. To make as standard cookies, bake for approximately 8-10 minutes. For two thicker cookies, split all the dough evenly between the two 9-inch round cake pans, extending the baking time by approximately 3 minutes. Another festive option is to bake one big cookie. For a pizza cookie, bake all the dough in a 14-inch round pan. 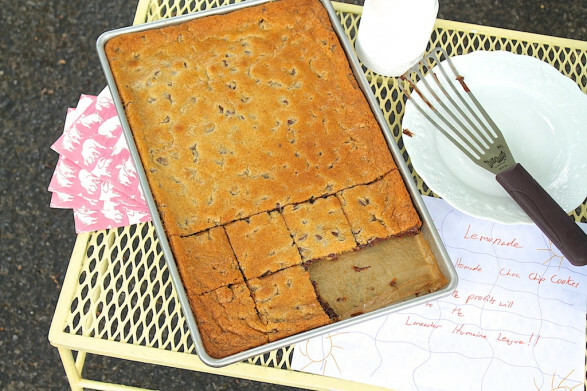 For an alternative to a sheet cake, bake in a 15×10-inch jelly roll pan or baking sheet with sides. In my oven, I also bake these pans for 15 minutes. To insert candles in the frozen chipwich, it is helpful to first make holes in the cookie with a skewer or the tip of a sharp knife. To easily write “Happy Birthday” or another message, melt a small quantity of chocolate chips (white, milk or dark) in a snack-size zipper-top baggie. Then, snip off a small piece of the corner and pipe the desired message. This may be done before or after freezing. Coincidently, we made the sheet cookie version for my younger son’s lemonade stand last weekend! Love this! So much faster and easier than making individual sandwiches! Can’t wait to make one, thanks for sharing! I tried making my own icecream cake this spring for my daughter and we all loved it. 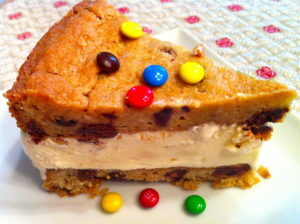 I will have to try this one- love the cookie/icrecream combo! I promise, Sarah, you will like it! Homemade ice cream would be extra fabulous! Yum! Hi, going to try to attempt making this for my son’s birthday-my only concern is that when I put it in the freezer the cookie will freeze also and will be difficult to cut? Any thoughts! If you let the cake sit at room temperature for 5-10 minutes before cutting, it should be fairly easy to cut. I use a large, sharp knife to make it easier. Also, I adapted my cookie recipe to make it a little softer–it’s not as crisp as a regular chocolate chip cookie when frozen. (That said, we really like these unfrozen, too!) Happy birthday to your son, and I hope you all enjoy! Thank you, Dina! It’s pretty popular here! I love reading your Sunday paper column and trying out your recipes. 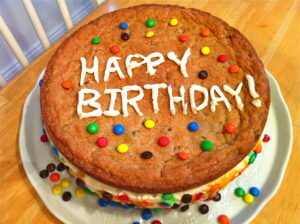 Our most recent trial was your ice cream cookie cake. I showed my daughter the picture of your cake in the paper and she agreed to make it her birthday cake. She loved helping with the cookie part of it and we had fun with a new type of birthday dessert. I was just glad she didn’t ask for an aardvark cake like her big sister did a few years ago. Yikes. Thank you for the wonderful feedback, Steph. I love that your daughter picked this and helped to make it…and I bet that aardvark cake was a big hit, too! This was a giant hit here!!! Just came to print this recipe. I make it every year for my son’s birthday and it is ALWAYS a mega hit. I also really appreciate that I can make it over several days and well in advance of the celebration if the week is a busy one! Too funny, Mary! I’m starting this today for my younger son’s birthday, which is coming up this weekend. I’m delighted your family enjoys it as much as mine does!